It’s been a hard summer for pit bulls in this city. There have been a number of dog attacks in the past three months and the media has managed to relate all of them to bully types. And of course they can’t do this without bringing up everyone’s favourite subject: BSL. There is nothing I can say on the topic that hasn’t been said a million times. Unfortunately, I don’t know if any of the public awareness campaigns, books, articles, blog posts, newscasts, or parades have made one bit of difference in the general public’s mindset. Articles like this one seem to have more power than all of the above combined. Just last week I had a conversation with someone on the bus about dogs. He said he loved large breeds but “would never, ever get vicious dog like a rottweiler, Doberman, or pit bull.” I probably should have jumped in to correct him but I was just too tired of having the same bloofy discussion over and over again. BSL concerns me greatly. There is already one county in this province with by-laws that legislate against certain breeds of dog. Albeit, a small county that hardly anyone lives in, but the laws are there. It concerns me as a dog lover and as the owner of a dog many people mistake for a pit bull. I am reluctant to even visit this county for fear of getting in trouble. I certainly don’t intend on spending any tourist dollars there. If my own municipality seriously considers moving in this direction, as is alluded in the article, I am not sure what we will do. Moving may become our only alternative. But all of this doom and gloom brings me to another pit bull related topic. One filled with much more hope! The inspirational humans behind the fantastic blog Love and a Six-Foot Leash have agreed to take in another foster, the absolutely stunning, undeniably fabulous, Lady Zabora! Unfortunately, Lady Z. may be in need of more help than one family can provide. At eight years old she is considered a senior. She suddenly found herself homeless and alone after her owner was incarcerated. Naturally, she ended up in the shelter. Unfortunately, this is not the end to Zabora’s troubles. She also suffers from a number of medical issues including arthritis, conjunctivitis, a mild balance problem, as well as complications due to her recent spay surgery. The rescue organization that agreed to take her on does not have enough resources to take care of her needs and make sure she is as healthy and happy as she deserves to be. The wonderful people behind Love and a Six-Foot Leash have decided to set up a trust fund for the family eventually lucky enough to bring her home. But they are going to need a lot of help to make sure she is ready for this next big step in her life. On their blog, they have asked readers to pledge their support. They have set up a fundraiser and the response has been incredible! In only a few short days they have managed to raise a large amount of money for Zabora’s care. The response from pit bull lovers has been so fantastic they have now put together a raffle with some pretty impressive donated items to give away to those who have supported the campaign. It’s heart-warming to see what a lovely little dog can inspire. Thanks to the contributions of many people, Lady Z’s life is going to change forever. But they still need help! If you are able to donate, please check out their website, and don’t forget to enter the raffle! There is a wicked Holga Camera calling your name. I wonder whether any of the “attacks” were at dog parks? 96 attacks over two months seems like a lot. I am not a fan of BSL, but then I am not a fan of a lot of dog-related legislation. The good always gets penalized along with the bad. I do agree with holding stupid owners of dogs who cause injuries accountable. But it seems to me that is something that doesn’t need a whole bunch of new laws. Lady Z is very cute. I hope she gets the help she needs. It’s complicated, to be sure. There are a lot of things going on during a dog attack. None of them good. From what I understand, many of these included dogs that were off-leash in on-leash areas and dogs that were unattended by an owner and running loose. I am not sure legislation will help prevent either of these solutions because technically these laws already exist. Dogs are not supposed to be off-leash on the street and they are never supposed to be off-leash without an owner around. Before the attack even began the laws were broken. People that obey laws don’t have dogs that attack and kill other dogs. More laws will only punish those responsible people who already follow them and do nothing to stop the irresponsible ones. I probably would have done the same as you concerning the man on the bus. It just gets old saying the same thing over and over. I hate when I hear of a dog attack on the news and it’s a Rott, Pit, or Shepherd of some sort. Granted that’s all we will ever hear as they either assume that’s what it was, or it simply won’t get reported if it was a lab or golden though they are near the top of the list for reported dog bites. In anycase I love reading all the foster and pit blogs. I still don’t know that I could do what they do, but I do what I can to change people’s minds about these breeds. And i make sure clients who own them or mixes of them know that because they got that dog they have a greater responsibility than Joe Schmoe to make sure their dog is a good citizen. But even then some get it and some don’t. I hope the breed bans stay out of your area, it will be a sad said if Canada goes the route we have here. I agree and maybe that should be part of the solution. There are a lot of clueless dog owners out there who are well-meaning but don’t really understand the basic nature of a particular breed of dog. Like people who get chihuahuas and then are shocked when the dog barks and is hostile to strangers. It’s the same as owners of Dobermans who don’t think about how the breed was created to be a guard dog. If you get a dog with an aggressive reputation you have to be aware of this and work hard to make sure your dog doesn’t become a stereotype. But how do we get this across? I think responsible breeders are already educating as much as they possibly can anyway. Perhaps there should be a test before you are allowed to own a dog? With simple questions that prove the person has at least read a pamphlet, like a driver’s permit? To be honest I wouldn’t mind if we took up some of the laws they have in the UK etc about who is allowed to breed their dogs and sell the puppies. The number of pet shops and puppy mills selling puppies is WAY lower than here due to them not being legally allowed to make money off an unsanctioned breeding. Having said that, I have always thought of breeding Luna. But my criteria has always been “do I feel she has qualities to contribute to the breed” it has never been simply to have puppies let alone sell them. And I do believe she has things to contribute to her breed, beyond her good looks ;-). Hunt drive being one of them, as I feel it has been lacking in the breed as a whole. If for some reason my opinions of her change before I get around to breeding her, that’s fine I will simply spay her and not breed her. I wish there was a class people had to go through before they could own a dog, especially some of the strong breeds that often end up in the wrong hands. But I doubt this will ever happen do to all of our “rights” “freedoms” etc just like there will more than likely never be a law saying you can’t sell puppies of an unsanctioned breed. It’s America, it just won’t happen. I LOVE when I hear of shelters requiring that adopters enroll dogs in training in order to be able to adopt them. Sets everyone off on the right foot. Maybe I will require this of my puppy owners too, and take the puppies back if I don’t see signs of them following through. It’s just not fair to put dogs in situations and in homes they should never be in in the first place. It really is not the dog’s fault, we create these problems through greed, selfishness, and plain stupidity. But I shall get off my box. Thank you for sharing all of your thoughts on these hard issues. I may be wrong on this, but I though UK did have BSL against pit bull type dogs. Has this been repealed? My sources may be incorrect and I will have to look it up again now. Any laws that go into place in regards to breeding should be done very carefully and thoughtfully. I know there are some who don’t believe anyone should breed at all due to the high numbers of dogs in shelters but I don’t think that’s quite fair. Do I think dogs should be bred solely for profit? Of course not. But I am hesitant to say legislation is the way to fix this. It worries me that good, responsible, loving people may be penalized through something like that. I definitely think mandatory training classes are an excellent idea. What is lacking most is education. I mean, I think I knew a lot before I got a dog and I realize now I really knew nothing. And I’d actually read quite a few books and done a lot of research. Not everyone is as neurotic as I am. It concerns me that many people just don’t know. I don’t think it’s always a case of not caring, sometimes they just have no clue regarding a dog’s basic needs. If this education was more widely available, we might see a difference. I’m not “pro” banning breeds, but something needs to be done about the aggressive lines. Having watched my dog literally getting torn apart by a German Shepherd, getting bit myself when I laid down on top of my dog to protect him, whenever I see a dog attack in the paper I get sick to my stomach. The owner of the dog received absolutely no fine, meanwhile I had over $4000 in vet bills. We had no choice but to sue them. I’d say 95% of the attacks in my area are by pit bulls. I think that is why they get such a bad rap. It has taken me over 10 years to be able to be in the same area with a german shepherd. But, my blood pressure goes up every time one walks in the agility ring, and I’m doing ring crew. I always breathe a sigh of relief when the dog is done with their run. Am I stereotyping? Yes, but I can’t get those images of my dog’s flesh flying through the sky out of my mind. It’s okay. I imagine I would have a very similar reaction. It’s only human. I’m so sorry you had to go through that. It never should have happened. My childhood dog was actually attacked by a pit bull while I was walking her down the street. The dog was off leash, running free in the yard, and lunged at us. Luckily we were both fine without any injuries but it did leave me shaken and it took some time to get over it. The pit bull should never have been put in that situation, I realize this now but it’s impossible to think such things when you are experiencing something like that. I agree there needs to be a lot more action taken against owners who allow their dogs to attack. Whether it’s a dog or a human. Banning the dog will not work, neither other laws that serve only to punish responsible owners or the dogs themselves. When a dog attacks, it’s that dog’s owner’s fault. End of story. That owner is the one who needs to be punished. Kristine, you are such a lovely person because your blog, rather than being the narcissistic rant that 99.9% of blogs (including mine) are, tries to help others as well, in both today’s and yesterday’s posts. I used to be one of those people who was in favour of pit bull bans. Now I am totally against them. However, I understand why others feel as they do. It’s because bully breeds can kill. Other dogs can bite and cause damage– there have been more than one Jack Russell incidents at our park– but you’ll never read the headline “Toddler Mauled to Death by Family Pug.” And for a lot of people, the risk is simply not worth it. I have to get around to a (narcissistic) post about the pit bull down the street from me. He’s the kind that gives them all bad names. 😦 I haven’t written it precisely because I hate to malign the breed, but at the same time bully breed advocates have to understand the realities and the perceptions of ban advocates so they can understand it from that perspective. You can’t debate what you don’t understand from both points of view. Hah! You’re funny. I can certainly rant and I think I do my share on this site, but I do try very hard to keep an open mind and withhold judgment. It’s not easy and I don’t always accomplish this, but I try. I love what you said about not debating what you don’t understand from both points of view. That’s perfect and so true. Back in high school when participating in actual formal debates, that was one of the things that was driven into us. We were encourgaed to take the opposite view and research things we didn’t actually agree with. It not only made for a better debate but it enabled us to be more aware that there really is more than one side. Often there are ten or twelve. BSL support gets whipped up by an anti-dog media in Australia. German Shepherds were once banned in Australia too. When people relay horrifying personal experiences about a particular breed, they get stuck with the images in their minds – but maybe if the owners of those dogs were actually held responsible then there would be some kind of closure…. German Shepherds were banned in Australia in recent history! If you ask some people, yes. They do believe all dogs should be banned from public places. Fortunately, I don’t think that’s going to happen here any time soon. Though who knows? You are right in that it should be the owners that are held accountable. That’s where the legislation should lie. Larger fines, pontential incarceration for those who own dogs that attack and kill. If you look at the history, bloodhounds used to be viewed as the most dangerous dogs back in the 1800’s, due to their work with police. They were followed by German Shepherds, Dobermans, and Rottweilers. Hopefully this widespread fear of pit bulls will pass. I just worry about what breed the owners looking for a “tough guy” image will chose next. yes but surely they are a very small minority… the problem is that these people will move on to another breed… and without an acknowledgement that the laws should be aimed at the people, not the dogs, the next breed will be targetted by media frenzy and BSL. I agree with everyone above, it is not the breed (although some due have the tendency to be more aggressive than others) but the owners. In the next town over a husky attacked and killed a neighbor’s chickens. It was witnessed by his four-year-old. The dog was impounded and sentenced to euthanization. A dog defense team got involved and luckily the dog’s life was spared. Here’s the rest of the story, the owner had been fined and warned in the past. He was told to put a fence up for the dog because the dog liked to wander, he refused because he didn’t think it was fair to enclose the dog. Someone in the same time who had acreage had offered to take the dog, still the owner refused. Long story short, the dog was surrendered and placed with someone who has tons of land, the dog is happy and being well taken care of. In general I don’t believe in banning breeds, but I do think there needs to be something in place regarding breeding ie who can breed, how often etc. Any dog can bite and any dog can kill. Case in point, my SIL had a chihuahua and when it approached her lab’s food dish, the lab grabbed and shook and the chihuahua died. 😦 Labs are the breed most likely to bite, yet for 20 years in a row, it has remained at the top of the list of dogs people own. If you own a dog you have a responsibility to your DOG as well as to yourself and others around you to be responsible, protect yourself, protect your dog and protect others. End of story. My childhood dog attacked and killed a neighbour’s turkey once. She was also a husky and the sweetest dog on the planet. Huskies naturally have a very high prey drive and are escape artists. Being a pure-bred, Nikita excelled at both these things, hence the death of the bird. It was a horrible thing to have happen and my parents paid for the cost of the turkey but it doesn’t mean my dog was vicious and should have been put down. “If you own a dog you have a responsibility to your DOG as well as to yourself and others around you to be responsible, protect yourself, protect your dog and protect others. ” Agreed. How can we put this into effect? I have no idea how to put it in place, I think we just need to continue in the manner we are doing. Blog about it and hope to educate as many people as possible. I can’t really remember to well. My parents certainly were not pleased but I think they were more mortified than anything else. She was a dog, dog’s chase birds. It was our fault for putting her in a situation in which she could escape and follow her instincts. If she was punished it wouldn’t have been anything more than a little solitary confinement. You are probably right. It’s just frustrating. Sometimes I just don’t have the energy to fight the battle. At the same time I had a rottie X who lived quite happily with a geriatric pet bunny, and he treated the bunny like it was a mini dog. He totally ignored the chooks. While he looked mean, he had no prey drive. I love photos and videos of dogs getting along well with animals that are normally prey! It’s awesome and shows how different every dog is. If a dog is socialized well with rabbits I have no doubt they could be best friends. I especially love that it was a so-called “vicious” breed. The Rottie X was a failed junkyard dog from a rough-as-guts place called Meekatharra. I don’t think he was aggressive enough, and was saved just before someone shot him! He had plenty of issues, but prey drive was one thing we didn’t have to manage, thankfully! Such an important post and thanks for helping out Lady Z! Honestly what frustrates me to no end about the whole blaming pit bulls is that most people couldn’t identify a REAL pitbull to save their soul. A few months ago there was a huge uproar over a “pitbull attack!” at a 4th of July fireworks celebration (because it’s a great idea to bring a dog to a fireworks display). The day-of reports focused on the dog being a pitbull. Turns out the dog was a purebred (with papers) rottie…because you know they are SO similar. They never really corrected their story…. after it was brought to their attention that some idiot coudln’t tell the difference between a 120lb rottie and a 40lb pitbull they simply called it a “dog attack” and made a one line correction on their print/web article. This is problematic for a few reasons… 1. pitbulls are being blamed for attacks that they weren’t involved with continuing to demonize them 2. the lack of ability (even in animal control facilities) to identify pitbulls leads to the death of many many boxers, LABs (yes labs! ), catahoula leopard dogs, mastiffs (french, italian mostly), and many mixed breeds that have no am staff or pitbull in them at all. I really wouldn’t say most attacks in my area are by pitbulls… but the attacks by the aggressive shih tzu down the street doesn’t make the news even though it has left puncture wounds on me… or the really nasty cocker spaniel cause $2000 worth of damage to a friend of mine’s great dane (who didn’t even fight back 😦 ) … the focus on sensationalizing pitbull attacks has, i think, created this belief that 1. only pitbulls attack (which is a VERY dangerous assumption to make) and 2. pitbulls are naturally aggressive and blood seeking monsters (which just is not accurate). What people who support BSL dont’ often know is that some of our favorite breeds are included on many BSL restriction lists (either full ban or restrictions placed on these breeds in various places that have BSL)–husky, akita, american bulldog, malamute, aussie, cattle dog,boxers, english bulldogs, chow-chow, fox terrier, french bulldog, golden retriever, german shepherd, labrador retriever, pug, newfoundland… etc. It’s all good. 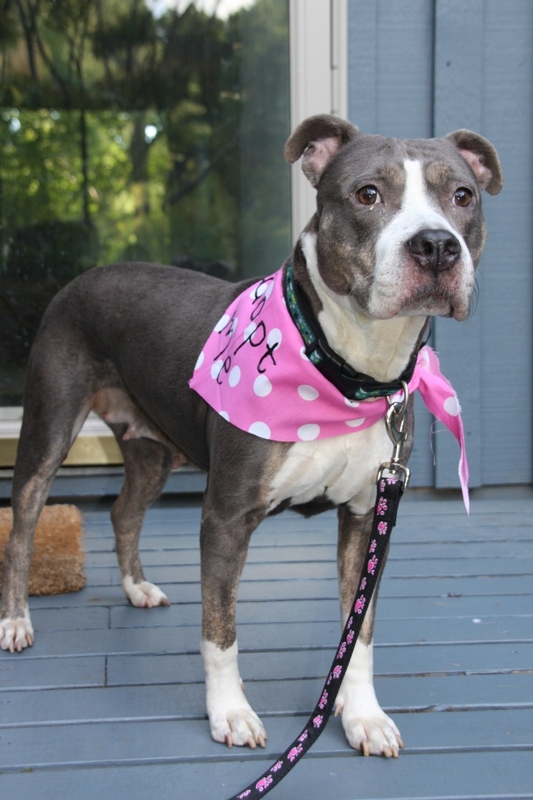 I did not intend for this to be a post about entirely about BSL, mostly just about pit bulls in general and the suckiness therein, but I should have known that acronym was bound to start something! It’s your second point I am most concerned about. Is the reason people have this idea of pit bulls as blood-sucking monsters due to the number of attacks or is it due to something else. Most of the attacks listed by the media in my area are often said to have been performed by a “dog that looks like it could have been a pit bull.” Which means it may have been a donkey for all I know. The witness to the event is usually a human who is incredibly upset, perhaps freaking out. I know if my dog was being attacked I would not necessarily be paying close attention to the attacker’s breed. I am not judging this person, not in the slightest, I am just questioning the validity of the dog’s identification. If it wasn’t for all the media hype, would the words “pit bull” even come to the victim’s mind? It’s impossible to say. Some breeds are bred to be more aggressive than others. I don’t question this. Pit bulls were bred to attack other dogs and so they may have difficulties, especially without any training, in reacting politely to a strange dog. But it is still not the dog’s fault when this happens. It’s humanity’s fault for a) creating them this way and b) not giving our dogs the proper training in order to live in our world. In a dog attack both the attacked and the attacker are victims. I’m going to keep mostly quiet here, because I feel like I’ve had this debate a lot of times already. But I think that we ought to spend more time thinking about the chicken vs egg question here. If it is true that pits and pit mixes are more likely to get into trouble, is it because they are pits and pit mixes, or is it because the type of people who tend to keep their dogs outdoors, not train them, use them as “guard dogs,” and neglect and abuse them are more likely to be drawn to these boxy-headed muscular dogs? And if pits and pit mixes were banned, would these same abusers just stop owning dogs, or would they find a substitute breed group — perhaps the akita, the great dane, the bull mastiff, the bulldog — to keep outside, deprive of love, training, and companionship? And would these dogs then end up being more likely to get into trouble and cause injury? And then would we have another breed type to ban? And this of course begs the question — are breed bans really the best way to go? Well said Aleksandra. I don’t know how many times I have clients (usually men) come in with their new lab puppy for training… wishing they could have a different dog like a shepherd, pitbull, rott etc. And when I point blank ask them why, they reply with “because they’re cool… manly” Perfect case of the WRONG reason to get one of these strong breeds. I like that you brought up the idea that they probably would end up turning some other breed into this “guard” dog figure. I bet that would end up happening. Until we get our heads right about why we are breeding a dog, and control the dogs that are not for breeding this will just continue to be one vicious cycle. We never seem to get at the root of the problem (who likes to look in the mirror right?) and instead just keep creating branches off the of the breed to “fix” (ie: shepherds, bulldogs etc) the problem. Agreed. As I said above, I did not intend to turn this into a discussion/debate on BSL. I cannot say things nearly as well as many other organizations have done. It was just on my mind as a result of the article published in my local paper and I couldn’t go without saying something. I think you put it brilliantly. I just don’t know how we get the general public to understand. You are doing a great job with your fosters, however, and I know you have changed many minds already through your blog. Your dogs have made a huge difference amongst many people who formerly feared pit bull type dogs. And I really want to thank you for that. As a Doberman owner, Breed Specific Legislation gets my back up (surprise, right?). I’m in the U.S., where some has passed, but in New York State, where it’s specifically illegal to make laws against specific breeds. A town in Long Island actually passed a pit bull ban and then had to repeal it because of the state-level laws that they apparently didn’t consult. Bad owners make bad dogs, and bad owners are attracted to big “tough”, “vicious”, “aggressive” breeds. People cross the street and shield their babies when I walk my Doberman, because obviously she’s going to eat them all. My cousin has a rescue pit, Addie, and they behave in the same way, actively fleeing down the street before him. If people would educate themselves, the world would be a better place. If dog owners would ALL behave responsibly, the world would be even better than that! Exactly! Bad owners make bad dogs. That’s the long and the short of it right there. Good owners do not own dogs that attack people. And if they do, they own up to their own mistakes. The onus is on the dog owner to behave responsibly and follow the law. Unfortunately, irresponsible owners like to ruin it for everyone else. Also- thanks for the mention of Lady Z’s fundraiser. We have been thrilled with the response. We likely will even have enough to cover lifetime arthritis meds for her, dear girl! That’s fantastic! Thank you for working so hard for her! You don’t know how many others you have inspired! 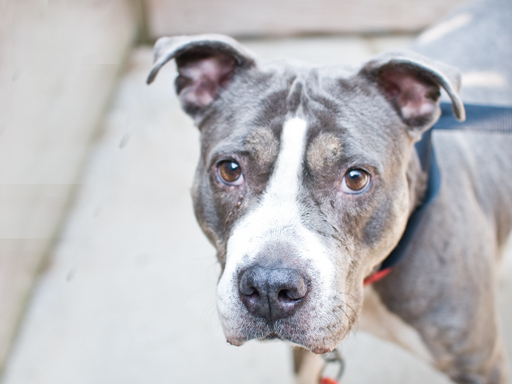 I feel fortunate that we do live in Chicago where people seem to be quite accepting of pitbulls. Though I did encounter a comment (the first time in several years) saying we were irresponsible for bringing our dogs to a street fest, because don’t I know those dogs kill people? But I guess this is also why we’re trying to get out there with our ‘grassroots’ efforts to show people the realities of pitbull ownership. And thanks for highlighting Lady Z! Who knew that a pitbull, and an elderbull at that, would win the hearts of so many people. It’s all in the eyes. Lady Z’s eyes have a way of burrowing deep until it’s too late to forget her. She looks like a pretty amazing dog and I wish there was more I could do to help. Your grassroots efforts have probably made a bigger difference than you even realize. Even if you are only changing one mind at a time, that is no small thing. You never know how many people have either adopted a pit bull or have at least started to look on them more favourably because of your actions and your website. And then those people have gone on to change other minds. It’s pretty awesome all around. Not much to add to what’s already been said, except that Aleksandra’s chicken/egg comment was right on. We’ll certainly visit LAAL’s blog and participate in the fundraiser – she seems like an amazing dog, and I certainly hope she can find a home with people who love her forever. The stereotype “bad dog” or bully has been around for many years. Way back when Kenny was a baby – a friends mother phoned social services on us because we had a german shepard. She filed a complaint saying our dog was going to kill this baby. Never happened – and we had Sheba for 16 years and she was great with all the kids. Some dogs are naturally more agressive – but good training and a good owner can control those tendencies. I don’t think any animal should be banned – but there are sure alot of people I would like to see banned from owning animals. If Sheba was anything like Senta, I know she must have been a total sweetheart. Some people just don’t like dogs in general and are afraid of anything larger than a shih tzu. No one is saying everyone must love dogs but it is terrible when they pass these judgments onto others without any form of understanding. Unfortunately, sometimes all it takes for a dog to be labeled “dangerous” is one person calling in saying they felt threatened. All of a sudden the dog is slapped with a muzzle order and the owner is forced to pay a huge fine. I’ve read about Lady Z on some other blogs, too. I love how the dog blogging community comes together to help those in need! I have a feeling that Lady Z is going to end up with the most wonderful home a dog could ask for after all is said and done, and she definitely deserves it! I know pit bulls can do damage, simply because they’re strong. But banning them because they’re strong is just silly. I finished reading the Pit Bull Placebo recently and read again the figures on how much less likely pit bulls are to bite than others…they are bred to be dog-aggressive, but very sensitive and gentle to humans. Of course there’s variation among individuals, and less trustworthy members of every breed–all the more reason we need better educated owners and more positive training! Couldn’t agree more! Thanks for mentioning the book. I will have to add it to my list! Yes, people dont realise that dogs can be aggressive with other dogs but not with humans, education is a wonderful thing! Great handling of a very sensitive topic, Kristine and everyone who commented. I don’t have much to add except I subscribe to the adage about there being no bad dogs, only bad owners. Which is a simplification and generalisation but I think the root of the whole BSL problem is people, not dogs. We don’t need more laws, rules and regulations, we need education. The people who need the education don’t follow the laws, rules and regulations anyway! So what can you do? Exactly, and that’s the trouble. More laws don’t work because people don’t follow them anyway. It’s not an easy solution as it is a very complicated problem. That’s what the media doesn’t understand. As soon as there is a dog attack they bring up BSL as if it’s going to solve everyone’s problems when really it solves absolutely nothing and may even make it worse. Since there are so many factors to consider, one law isn’t going to make much of a difference. I hear you. It’s like banging your head against your desk sometimes.